On Wednesday, December 5th, the Falcon 9 SpaceX rocket launched to the International Space Station (ISS) carrying 5,600 lbs of supplies; a small portion of which were mice of varying ages2. 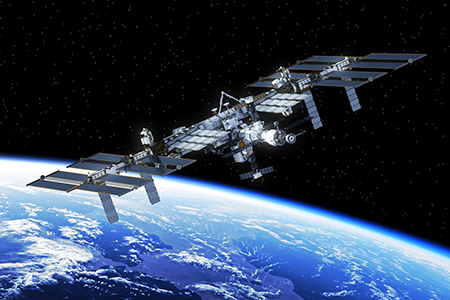 Animal models have been used in space research since the 1940s, and these ongoing projects help us understand how spaceflight affects health in greater depth. This review will highlight the various animal models that have been used in space research, the data obtained from these missions, and the key reasons why researchers continue to send animals into space. The first animal models in space were fruit flies (Drosophila melanogaster) sent via V-2 rocket in 1940. D. Melanogaster has been used extensively in genetics, physiology, pathogenesis, and evolutionary research fields due to its well-characterized genome. The goal of the study was to assess the mutagenic effects of high-altitude radiation on the fly's DNA1. Nine years later, higher-order animals were sent into space to test whether the gravitational force associated with the launch would cause any harm. After multiple unsuccessful high-altitude flights with mice and monkeys, a rhesus monkey and squirrel monkey both survived the launch and subsequent landing of a spacecraft in 19593. Over the next fifty years, monkeys, dogs, rabbits, and other small animals were used to test the effects of microgravity and biological effects of g-forces. Not only were these animals studied after they returned to earth, but had various sensors to measure their vital signs throughout the flight. Blood pressure, respiration, and heart rate are just an example of the statistics monitored once the animals were exposed to microgravity. The first humans went into space in 1961, only two years after the successful launch and landing demonstrated with the monkeys. In April 1985, Sprague Dawley rats were sent on the STS 51B/SpaceLab 3 flight to validate new equipment developed to hold rodents on the shuttle for extended periods of time. Mice and rats have become the most common animals used in microgravity research for several specific reasons. Due to the need to refill supplies at the ISS, space and payload weight is limited in the resupply rockets. In comparison to larger animals, a cohort of forty mice occupies less space, requires less food and water, and can provide the same valuable information to researchers. Additionally, due to their two-year lifespan, a mouse that spends one or two months in space is similar to a human spending five-to-ten years in space4. Mice that are sixteen-months-old experience similar physiological symptoms that are present in sixty-five-year-old humans. This allows researchers to study the effects of long-term space residency with significantly a decreased timeline. Mice cohorts are identified and bred to the correct health standards and age by the model provider. For the missions that have occurred in the last four years, the mice are transported to Cape Canaveral, FL four weeks before the launch to ensure proper acclimation to the mouse housing facilities on site. Once the mice are launched to the ISS, they are placed into specialized transporters equipped with food, water, lights, and cameras. These cameras can broadcast their video signals to veterinarians on Earth who regularly monitor the condition of the mice5. (Just launched on December 5th, 2018) The goal of RR-8 is to study the physiology of aging and the effect of age on disease progression by utilizing mice of various ages6. Maintaining rodent-based studies in space has many benefits for aging-related disease studies and the development of new treatments. While numerous animals have been used in space research studies over the last seventy-five years, it is vital that future experiments contain the minimum amount of animals needed for the success of the study. Taconic Biosciences has been involved with NASA since 1985 and has provided mice cohorts for six Rodent Research missions7. 1. Beischer, D. & Fregly, A. Animals and man in space. A chronology and annotated bibliography through the year 1960. (1962). 2. Lewin, S. SpaceX Launches Dragon Cargo Ship to Space Station, But Misses Rocket Landing. Spaceflight [Online] 2018. 3. Gray, T. A Brief History of Animals in Space. NASA [Online] 1998. 4. Mousetronauts: Animals in Space. Foundation of Biomedical Research [Online] 2016. 5. Rodent Research. NASA [Online] 2017. 6. Rodent Research-8 (Rodent Research-8 (RR-8)). NASA [Online] 2018. 7. Mice in Space: Taconic Mice Included on Launch to International Space Station. Globe Newswire [Online] 2017.